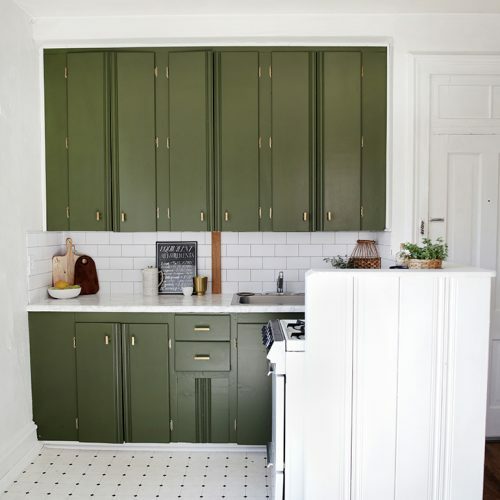 I have been in love with chalkboard paint for years. 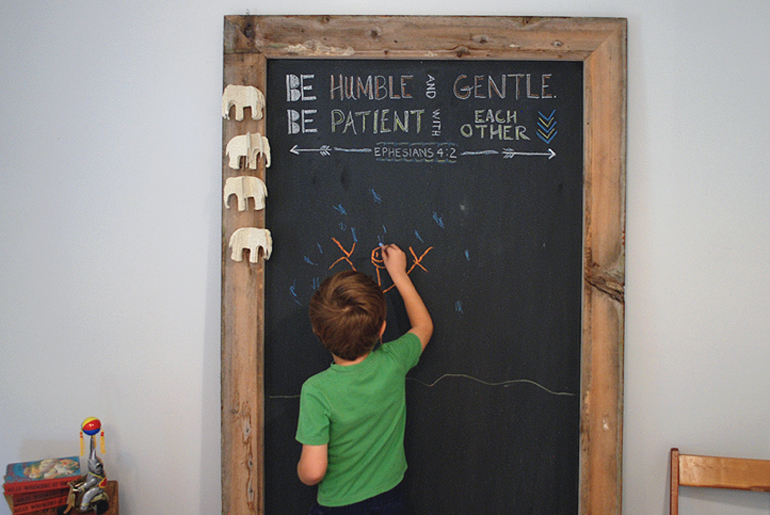 I’ve been begging Mike to let me paint (okay, have him paint), some wall in our house with chalkboard paint. The problem was, I could never quite decide where exactly was the best place. I have a really hard time making decisions. Especially when it involves paint. Mike didn’t want to paint an entire wall only to have me decide a couple of months later that I didn’t really like that wall painted with the chalkboard paint. And that’s where this giant chalkboard came in. With this, I get a large chalkboard and it can move wherever I want when I change my mind! With the circular saw, cut plywood to the size you want the chalkboard to be. Remember that the frame will take space around all the edges, so be sure to take that into consideration when sizing out your chalkboard. Again using the circular saw, cut the reclaimed lumber to size to frame the chalkboard. Nail the corners of the reclaimed lumber together to form the frame. You can also use wood glue, along with the nails. The outside frame of the chalkboard is now complete. Following the directions on your can of chalkboard paint, paint your plywood. It may take 2-3 coats. Follow the instructions on the can for dry time in-between coats. Once the paint is completely dry, attach the painted plywood to the back of the frame using the screw gun and screws. Some chalkboard paint requires conditioning before use. Ours needed to cure for 3 days and then be covered entirely with chalk and wiped down. Read your paint can to be sure to condition your chalkboard correctly. 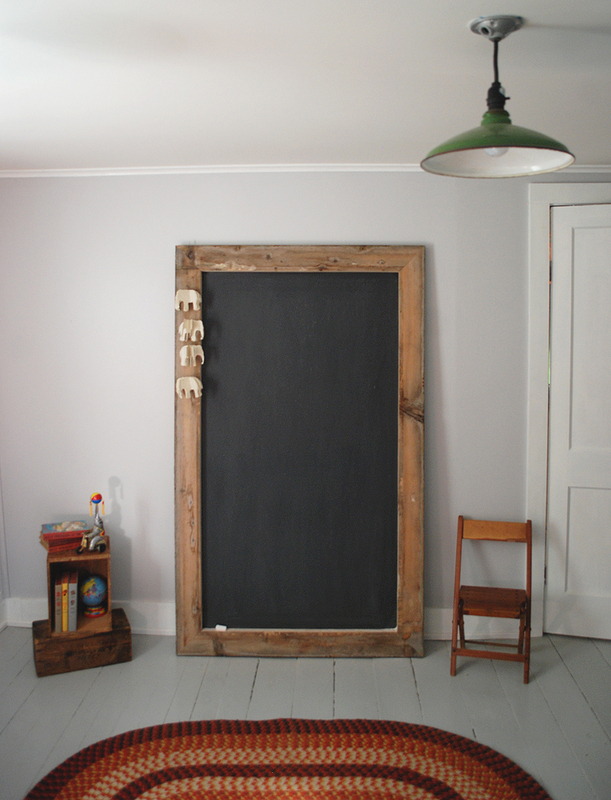 If kids will be using your chalkboard, it should be attached securely to the wall. 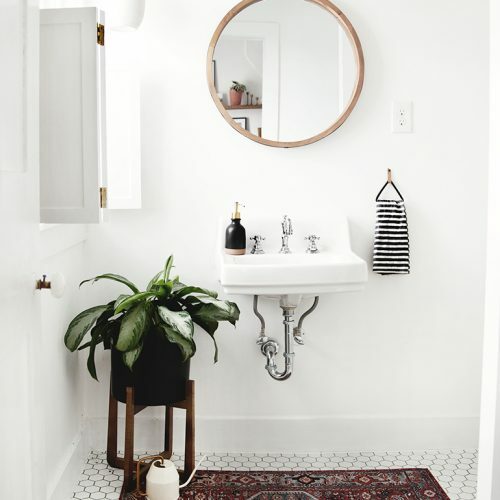 (Ours sits on the floor and leans against the wall, but the top can be attached to the wall). 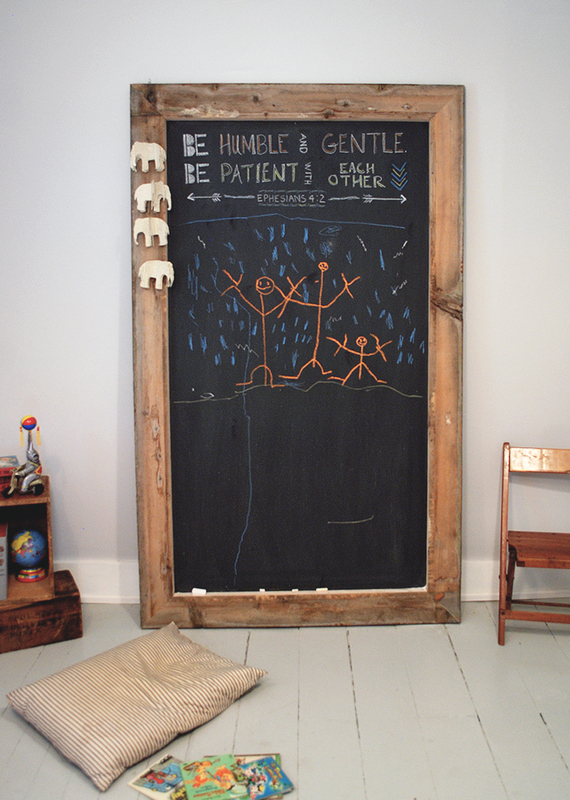 And for those that care to know, our chalkboard measures: 72.5″ tall, and 43.5″ wide. 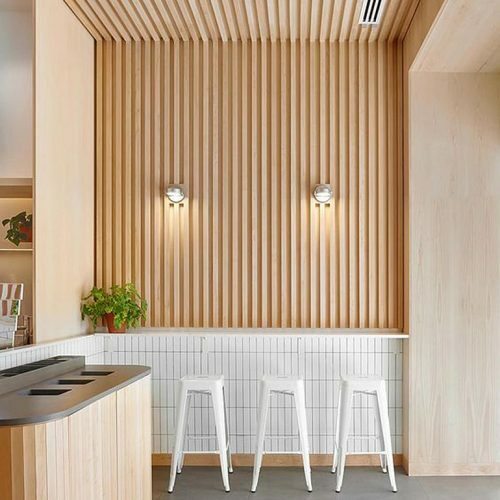 The lumber frame measures 4.5″. I love how this turned out. Sometimes my expectations for how I want things to turn out and the reality of how they really turn out don’t really match up. But this project did. And the boys love the new chalkboard. Malacai walked into the room where it was and said, “this could be our clubhouse too”. Right now, it’s all about forts and clubhouses in our house. (And Starwars & Batman. Oh so much Starwars and Batman). K & I have one just like this!! The only (sad) difference is that we got ours at Pottery Barn YEARS ago, & you two went and made your own! So proud! Love this. I went searching because I wasn’t sure if I could just use plywood, or if I needed some special “smooth” wood to create a writeable surface. Yours looks to be working fine however! 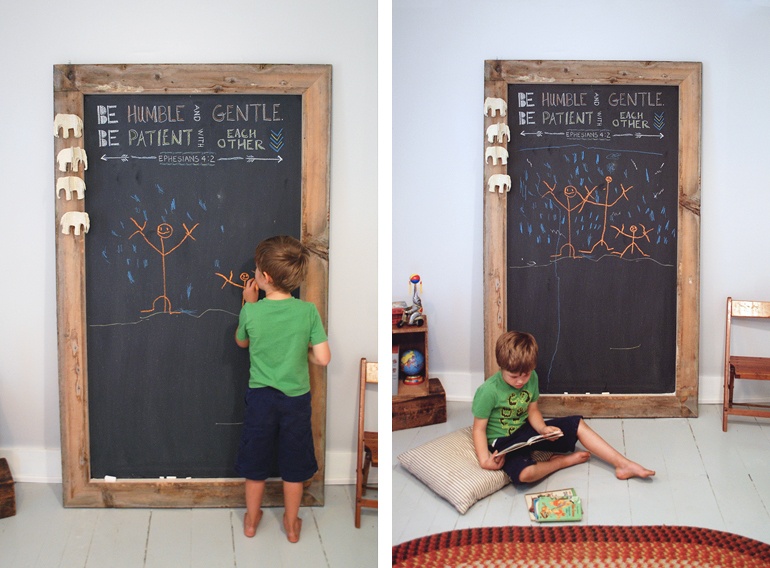 So off to Home Depot to get a 4’x8′ piece of chalkboard that I can paint and hang for our homeschool room.